I’ve played a lot of D&D. I had my first taste of it in the final days of AD&D2e. It was ok, but I never really understood how it worked, that always had to be handled by my DM. And when 3rd came out, we switched. 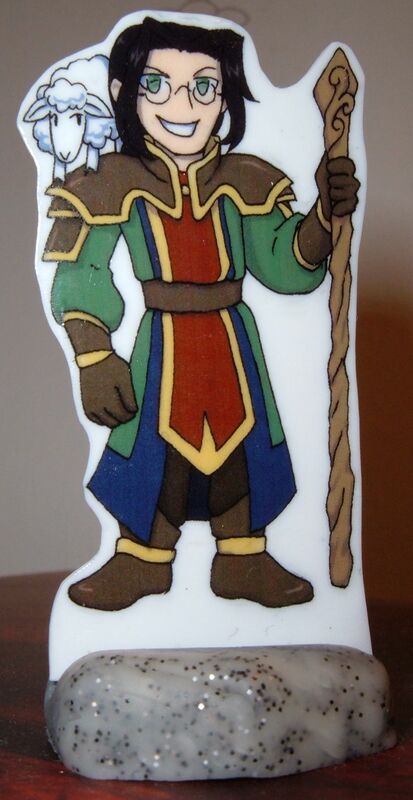 I’m one of the few people who actually bothered converting an AD&D2e character to 3e. When 3e came out I liked it. The game system was revised. Things like certain races only being able to get to certain levels of a class were gone, the rate of XP gain was unified, and it introduced the modifier system for stats which replaced so many copious tables and was one of the best things to happen to D&D since the d20. In short, 3e was good. I played many a great games of 3e, and I had many great adventures dealing with the Coryani Emperor’s mad plans in Onara, navigating the twisted intrigues of Sharn in Eberron, and driving out giant hordes from Geoff in Greyhawk. But at the same time I was enjoying 3e I heard the wails and the gnashing of teeth of people who hated the change. 3e is an abomination. They’re taking all the flavor out of the game. They’re dumbing it down. All the role-playing flavor is gone. 3e is a money-grab. Why can’t they just stick with AD&D2e. 3e is a horrible flop and they’ll have to go back to AD&D2e. I remember hearing all those arguments back in 2001 and well on into 2003. I remember being berated for even mentioning that 3e was D&D. So when 2008 rolled around I suppose I shouldn’t have been terribly surprised when history repeated itself and I hear the same sorts of arguments when the 4th edition of D&D saw the light of day. And you know what, I get why someone wouldn’t like any sort of new version of their favorite game. There are plenty of changes. Some you’re not going to like, nevermind the fact that most of us are pre-disposed to dislike changes of any kind. Toss in the fact that a new edition is a request for you to buy new product, and I completely understand how that could be a deal-breaker of sorts. What I have never gotten though is the need to heap abuse upon anything about the new version or anyone who uses it. I mean “Gabe” from Penny-arcade had “4e is an abomination, you should play X, that’s the real version” as one of the top things he’d been emailed about his D&D campaign. Is that really the kind of message to send to someone brand new to the game? Then again, I never really understood “system fanboys” and “Mac or PC fanboys” and it seems to be pretty much the same phenomenon, and let’s not even get into “real-life” issues that delve into the same territory. Back to the matter at hand, sometimes I am foolish enough to get into this “discussion”. Though it’s never really a discussion so much as an opportunity for people to sling hate at each other. On one of these occasions I was told, in classic hyperbolic fashion, that there was nothing good about 4e. So rather than being smart and not getting involved, I instead decided to write-up a list of everything off the top of my head that I thought was an improvement that 4e made to the game. Then my list was 32 items long. I have since added three more. Even though getting into an argument which is probably nothing more than an exercise in misplaced anger wasn’t the wise thing to do, I still think the list that was written up was an interesting thing to look at, and so it deserves to be shared here with anyone willing to take a look at it. I don’t think I imagined the list would get so long when I began writing it. A few disclaimers before the list begins, however. I imagine someone is going to say something about how one edition promotes role-playing more than another, and you won’t see that on this list. I decided to keep this list about the game design itself, which keeps other external things like book layout out of the list too. For the record though I don’t think either game by its nature encourages role-playing more or less than the other. Look for a future article where I explain why. Also 4e is not perfect. I could make a list of things I don’t like about 4e too. It’s not perfect, and with any luck when 2015 or so rolls around at 5e comes maybe some of those things will be addressed. So without further ado here is my list of 35 improvements I think 4e brought to the game. Cone and Burst templates replaced with easy to follow Burst and Blast squares which do the same thing but do not require memorizing the square pattern or having a template, such as the ones by steel squire. No more groans from Entangle being cast. Wire coat hangers everywhere breathe a sigh of relief. Skill system was redesigned so similar skills were combined into groups, eliminating the need for skill synergy as synergistic activities are now part of the same skill. All classes tend to have skills that are often relevant in every adventure. Skill point system replaced with / untrained / trained / skill focus setup. Generally in this game and 3e what happens is players will max out certain skills and just continually put a point into it each level to keep it maxed. Now this simply happens automatically as training and skill focus are flat bonuses that can be given to skills and all characters get a half their level as a bonus to skill checks. This also has a side effect of ensuring your character improves overall at skill related tasks to represent experience gained as an adventurer, rather than eternally being pathetic at a number of tasks like what would happen in the earlier system. Large Base Attack Bonus, Fort, Reflex, Will tables replaced with static bonuses at level 1 based on class and defenses, attack bonus, ability checks and skill checks increase by 1 every other level (IE: Half level). I’m never going to forget what a pain it was leveling up my Fighter/Wizard/Spellsword at level 10 having to references three different charts. Game is stable and consistent through levels 1-30, where as 3rd has a “sweet spot” of 5-12. Before level 5 characters are rather weak, after level 12 the game breaks down. Vancian spell casting is gone. Spells now use a unified easy to understand implementation that is shared by all powers regardless of the power source while still keeping their flavor due to the properties available to the powers themselves. Fireballs still explode and need good reflex to avoid and roast your party members if you’re not careful, while divine casters often need not worry about this as their offensive prayers usually only hurt enemies, but they tend to have less offense in comparison. Martial characters still primarily deal in AC. Players do not need to learn whole new systems to understand spell casters or psionic characters. Powers system allows for all classes to shine in their own way and emulate the feats of heroism that players are accustomed to in legends, stories, books, movies, and yes, sometimes video games. Large number of powers to choose from allows characters to make their character different from others of the same class by the selections they make. Power selections also allow martial characters to differentiate themselves from other martial characters more so than in earlier editions, where before only spell-casters got that kind attention. Rogues in combat are no longer just a defined by their sneak attack, but their ability to blind, cripple, slip through defenses, etc. Races strengthened and made more unique. Races are more important throughout a character’s career thanks to more feats and class options related to race. Had side effect of no longer requiring ECL for many classic D&D races. Combat rules streamlined and unneeded complexity removed from key areas. Roles for Monsters and Character Classes make it easier for the DM or Players to narrow down their search for what they want to play or what monsters to include and careful choose which entries they want to read fully. 3rd edition followed a “battle of attrition” model of balance, where upon players would face a large number of easy challenges that would spend their resources and player’s mistakes would come out most of all in later encounters where resources they spent in the beginning encounters cause their downfall. This lead to the “30 minute day” where players would get up, fight something huge, then goto bed. (The length of time it takes to run encounters encouraged this as well.) This lead to DM’s often having to pump things up for the one big fight to work correctly. 4th edition centers more upon each encounter being dangerous and less on attrition between encounters, encouraging parties to continue adventuring. Encounters are now easier to create. Monster types make it easy for DM’s to get ideas how a group of monsters interact with each other, avoiding game-breaking combinations. The effects of traps in an encounter with monsters are now easier to determine. As a result, traps are more often parts of combats and not “That thing that happens between combats”. Skill challenges give a framework for DM’s to visualize and create a variety of non-combat based encounters. (Previously you just kind of winged it.) Skill challenge system is flexible and abstract so it is not confining. Fantastic terrain added, effects of natural terrain more clearly defined. Disease system is more robust, with variable effects dependant on the stage of the disease on the affected character. Sizes of creatures adjusted and consolidated. No more piles of tiny sizes most people don’t remember and no more colossal size that filled up most people’s game mats. Have you seen that Colossal Red Dragon mini in person? It’s huge. It’s a statue, not a mini. Classes always gain something each level. No “dead levels”. Epic levels (21-30) no longer need a separate system to use and are part of the core game. Note that Level’s 13-30 in 3rd are past the sweet spot of 5-12 and game mechanics break down in those levels. Epic destinies get players to think about how they want to exit the game when it’s over. Epic destinies have many important world-changing events in them which can spur on future campaigns. System is written from the ground up to accommodate future books and expansion without breaking the core system. Encounters are generally based upon groups of monsters opposed to 3rd ed being largely based on “The one big thing”. This makes movement and tactics more important, making combat more interesting. 4th edition however can still easily do “the one big thing” very well, where as third has lots of difficulty with groups of monsters, especially if you’re talking about more than a pair of the same monster. Monster stat blocks are easier to read and are written with running them at the table in mind. Running monsters is vastly easier as a result. Death and dying rules allow for the character’s health to be taken into effect (Death at -Bloodied instead of -10), while at the same time making it so the dying state is more dramatic, yet simpler to manager. The three failed death saves per encounter and you’re dead is simpler and more effective than the -1 hit point or 10% stabilization a round. The unneeded 0 hit point condition of disabled has been removed. Magic item slots consolidated. With three primary slots, weapon, armor, and neck, and the rest being supplemental. Stat boosters items that were required for progression removed. Encumbrance rules simplified. No more unwieldly chart that just gets ignored. Swimming and flying simplified and made easier to understand and run creatures with those abilities or adventures in those settings. Frustrating grapple rules eliminated. Monsters that were grapple-centric now have abilities to represent this, making them simpler to run while keeping their flavor. Healing surges take much of the need to manage healing resources off of the cleric. Healing surges encourage the encounter-centric game balance and de-emphasize attrition-based challenges. Fort, Reflex, and Will saves turned into defenses just like AC. This streamlined attacking because the die rolling is all on the attacker’s side and not the defender’s side. This also tends to make things easier on the DM. Spells with durations longer than a round have been replaced with effects that can be sustained by the caster or effects that need the target to make a saving through (10+ on a d20) every round to escape the effects of the spell. This makes it so you do not end up having to keep track of the duration of several spells cast on you like in previous editions, and you simply have to remember if something is cast on you or not. Once again, this tends to make things easier on DMs. Recharge system replaces effects that were often “recharges in 1d4 rounds”. Recharge powers now instead list what numbers on a d6 that must be rolled to get the ability back. The monster rolls a 1d6 each round and if one of those numbers come back up the ability returns. Instead of “ticking off” rounds for the ability the DM only has to keep track if the ability has been used or not, and remember to roll recharge each round to see if it comes back. Being that I play D&D and lot, play and run games at the local game store, and am generally at the game store it’s no accident that I’ve heard of Blood Bowl before. The miniatures game by Games Workshop pits two custom made teams of players against each other each other in an incredibly violet game of a football like sport. Around here they organize into Blood Bowl leagues around this time of year and really get to it. It’s always sounded like something really fun to play. Now I’ve never picked this game up because I haven’t been looking forward to getting into another game, but also the game isn’t cheap and it requires the assembly and painting of small pewter miniatures. Something I’ve been needing to do with a whole bunch of miniatures that I have. 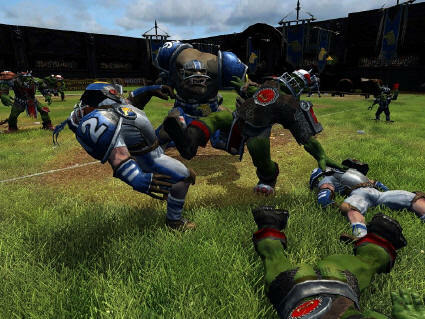 So when I heard about the Blood Bowl video game I was intrigued, but I didn’t pick it up because I wanted to try it. Unfortunately no demo ever surfaced (why?) but I recently got to try it at the local game store that has it installed. And I’ve got to say, wow, this game is just pure fun. I mean I pretty much I have easily emptied out an entire day into play the game after I purchased it. It’s really nice to see a good turn based strategy game on the PC, and the fact that the game is about getting the ball to the goal rather than eliminating the opponent really makes for a great change of pace. There’s just something really magical about having a turn where you tackle the ball carrier, send your catcher into the end zone, and have your thrower inch up, grab the ball, and toss it through a narrow open lane for a touchdown. Guess this means I might end up looking at the Blood Bowl pen and paper game box a bit more seriously next time I’m at the store.